Many of you are probably familiar with some version of baked Peanut Butter Oat Bars. I pretty much grew up on them and make them for my family often. They’re like a peanut butter & jelly sandwich, but a bit healthier. Today I’m gonna share with you a variation of the classic baked recipe – no-bake peanut butter & jam thumbprints. Here’s a little story behind this recipe. Let me start by saying that my 2.5-year old daughter (Katie) is quite picky when it comes to food. She also goes through a lot of changes and the food she loved at one year old is certainly not what she likes right now. It’s not uncommon for me to think that I’ve found foolproof child-friendly recipe, only for it to be rejected the next day. 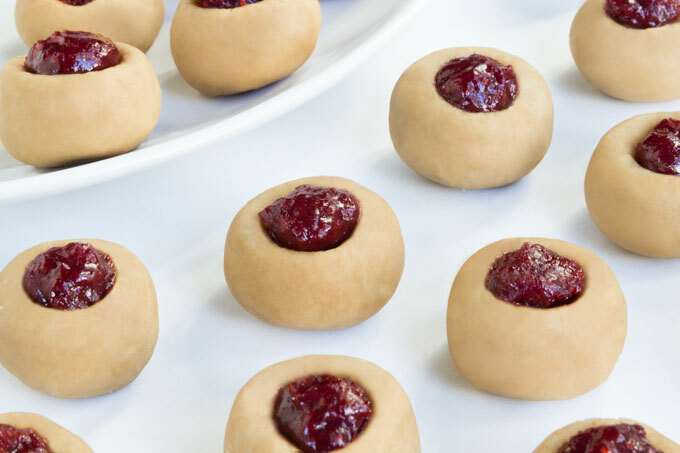 I’m happy to say that these no-bake peanut butter & jam thumbprints have not been rejected yet. The recipe was born on one Saturday morning when I asked Katie what she wanted for breakfast. “Peanut Butter Oat Bars”, she said without a hesitation. Confident that I still had some left (I always make a big batch for a quick snack or a breakfast on the go), I opened up my pantry and reached . . . into an empty container. Of course, Katie insisted that those bars were the only thing she wanted and nothing else. So I decided to make a quick, no-bake, version of those bars right then. Well, another challenge I ran into was that I was out of oats. 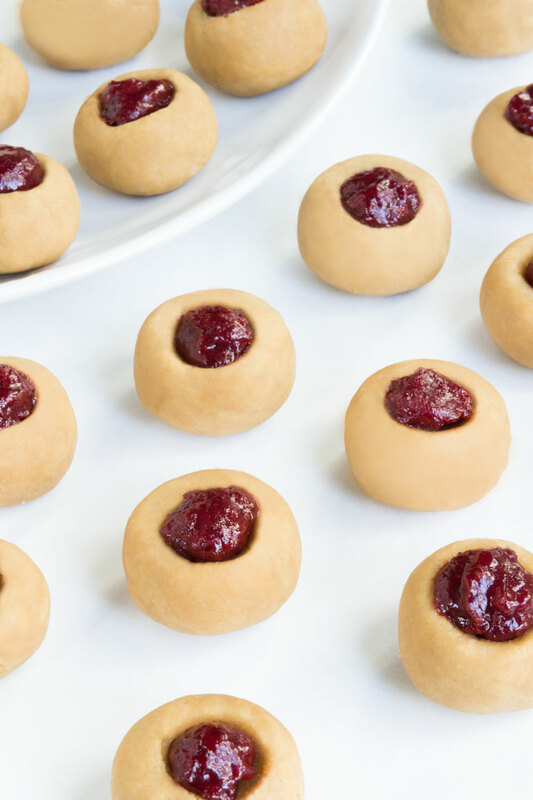 So these peanut butter & jam thumbprint cookies are not only vegan, but they are also paleo. While you can make several different variations of this recipe, here’s the combo my family loves. I shouldn’t even talk about peanut butter because I am kind of addicted to it. So, naturally, I think that these cookies taste the best with peanut butter. I haven’t tried it myself, but you can probably experiment with different nut butters. Almond butter or cashew butter, for instance, sound delicious. However, I think that nothing beats the combination of peanut butter and jam. Coconut flour is one of the best ingredients to thicken recipes – from smoothies and porridge to soups and baked goods. Not only does coconut flour absorb liquids really well, but it also easily absorbs flavors, becoming one with the peanut butter and maple syrup. You can use any liquid sweetener you like. I went with maple syrup because we have plenty of it here in Canada. Just keep in mind that every liquid sweetener has different level of sweetness. Maple syrup is especially sweet so if you use other liquid sweeteners, you might need to adjust the amount. As far as the jam goes, I made my own for two reasons – I had a lot of strawberries on hand and I wanted to make sure the jam was the right consistency. A lot of store-bought jams are just too runny for taking these peanut butter & jam thumbprints on the road. I like to pack these cookies for trips or stick them into lunch boxes so the firmer the jam, the better. I used agar powder as the thickener, which is an algae with a powerful (8 times more than gelatin) jellying property. Agar not only allows for a speedy jam, but it also helps retain the flavor of the fruit so you don’t get the cooked taste. You can also use my instant raw jam for these thumbprints. 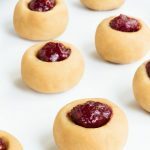 These peanut butter & jam thumbprints are really easy to make. However, there are a few things you wanna keep in mind. First of all, the dough should be moist and a bit sticky. It you add too much coconut flour, the dough will dry out and the thumbprint cookies will begin to crack as you make the indentation. Every coconut flour is different so start with less and add more as you go. When forming the thumbprint shape, I always roll the dough into small balls first. Then I take 1/4 tsp. measuring spoon and make an indention. I’ve found that the best way to prevent any cracking when making the indention is to cup the cookie with the palm of my hand, keeping the dough as compact as possible. 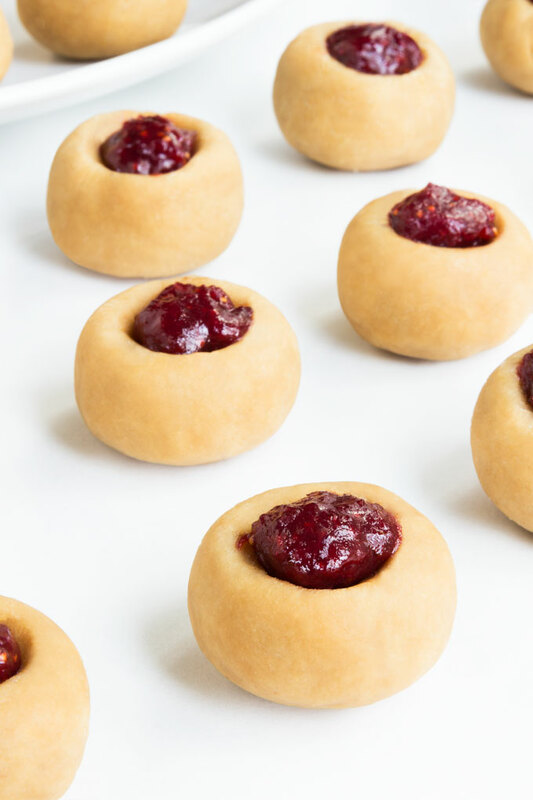 These no-bake peanut butter and jam thumbprint cookies are naturally vegan and paleo. They are chewy, soft, and deliciously dense. Line a baking sheet or a large plate with a piece of parchment paper or a silicone mat. In a medium bowl, add peanut butter, maple syrup, coconut flour, and vanilla extract. Whisk as long as you can. When the mixture gets harder to stir, use a rubber spatula to fold until well incorporated. If the dough is too soft to roll into balls, place it in the refrigerator for about 30 minutes. Roll into 1" (2.5 cm) balls and place on a parchment-lined plate. Create an indentation with the back of a 1/4 teaspoon measuring spoon (or create whatever size indentation you'd like). Fill each with 1/4 teaspoon strawberry jam (or however much you'd like). Store the thumbprint cookies in an air-tight container on the counter or in the fridge for a longer shelf-life. Cut the strawberries into small pieces and place them into a small saucepan together with the maple syrup. Add a little bit of water to cover the bottom of the pan. Let the strawberries simmer over low heat for about 25-35 minutes, or until they are soft enough to mash with a fork. Mash the strawberries so there are no large pieces left. Add the agar agar powder and boil the whole mixture for an additional minute. Poor into sterilized jar and let cool before using. Store leftover PB&J thumbprints in an airtight container in the refrigerator for up to 1 week. *Every coconut flour absorbs liquids a little bit differently. Start with the lower amount and add more as needed. **You might need to use more agar agar powder if you use frozen strawberries. Thank you so much for sharing your lovely creations. These were delicious! I made these with almond butter as didn’t have any peanut butter at hand. They got eaten in a few minutes, had to ask my son to slow down, so we could try a couple too! And my 2y.o. daughter enjoyed tasting the dough as she helped stirring it 😀 Thank you so much for sharing this recipe. I love your other creations too! Omg I just found your website and YouTube channel and I’m obsessed! I’m making a few kinds of raw cookies for Christmas morning and wanted to include these as well… my plan was to wake up early and throw all the cookies in the dehydrator for 4-5 hours to make them warm and chewy. 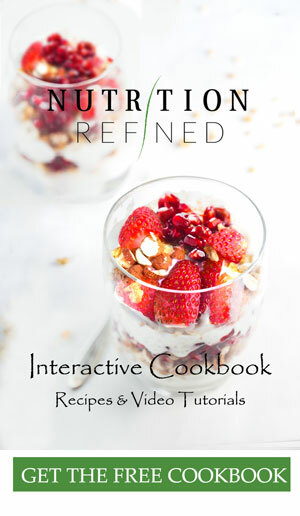 Have you tried this recipe in the dehydrator?